How do I embed google photos video in a webpage? There are several ways out, I will show you my way to do it simply and quickly. How do I embed google photos video in a webpage? There are several ways out, I will show you my way to do it. 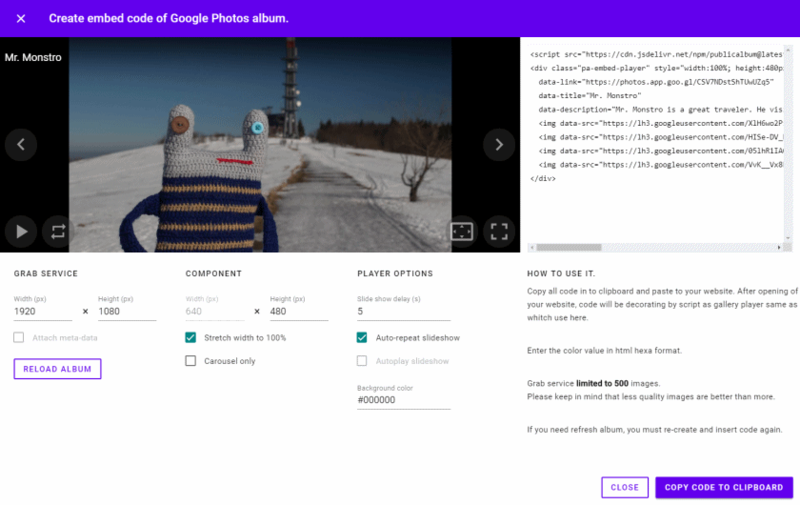 Easily and quickly using one of my tools to get the code to embed a video from google photos. After a pause when I only improved the existing tool, I represent a new component for you that is meant to embed a photos album to a website. It is a carousel widget that is also the basis part of the new component of the gallery, which I will describing in some another post. Carousel widget demo with my favorite Mr. Monstro. Author PavexPosted on February 25, 2018 March 4, 2019 Categories Google Photos22 Comments on How do I embed a Google Photos album into a website?